Critics of AI risk suggest diminishing returns to computing (formalized asymptotically) means AI will be weak; this argument relies on a large number of questionable premises and ignoring additional resources, constant factors, and nonlinear returns to small intelligence advantages, and is highly unlikely. Are all problems worst-case and NP-hard? Are all implementations equally fast? Computational complexity theory attempts to describe the resource usage of algorithms from the abstract vantage point of considering how running time on some idealized computer relatively increases for a specific algorithm as the inputs scale in size towards infinity. For many important algorithms used in AI and programming in general, the difficulty turns out to increase steeply with extra data—comparison-based sorting algorithms like Merge sort take only Big O O(n⋅log(n)) and so you can sort just about any amount of data in a feasible time, but more interesting problems like the Traveling Salesman problem/3-SAT become NP-hard (or exponentially or worse) as the data increases and quickly go from fast to feasible to impossible. One argument against powerful artificial intelligences, and scenarios corresponding to Singularities in general, draws from computational complexity theory. Are we headed for a Singularity? Is it imminent?…But regardless of which definition you use, there are good reasons to think that it’s not on the immediate horizon…This is the so-called ‘hard takeoff’ scenario, also called the FOOM model by some in the singularity world. It’s the scenario where in a blink of an AI, a ‘godlike’ intelligence bootstraps into being, either by upgrading itself or by being created by successive generations of ancestor AIs. It’s also, with due respect to Vernor Vinge, of whom I’m a great fan, almost certainly wrong. It’s wrong because most real-world problems don’t scale linearly. In the real world, the interesting problems are much much harder than that. …Computational chemistry started in the 1950s. Today we have literally trillions of times more computing power available per dollar than was available at that time. But it’s still hard. Why? Because the problem is incredibly non-linear…How fast? The very fastest (and also, sadly, the most limited and least accurate) scale at N2, which is still far worse than linear. By analogy, if designing intelligence is an N2 problem, an AI that is 2x as intelligent as the entire team that built it (not just a single human) would be able to design a new AI that is only 70% as intelligent as itself. That’s not escape velocity. In my previous post on why the Singularity is Further Than it Appears, I argued that creating more advanced minds is very likely a problem of non-linear complexity. That is to say, creating a mind of intelligence 2 is probably more than twice as hard as creating a mind of intelligence 1. The difficulty might go up exponentially. Or it might go up ‘merely’ with the cube or the square of the intelligence level you’re trying to reach. Blog reader Paul Baumbart took it upon himself to graph out how the intelligence of our AI changes over time, depending on the computational complexity of increasing intelligence. …Every other model Paul put into his spreadsheet showed convergence instead of divergence. 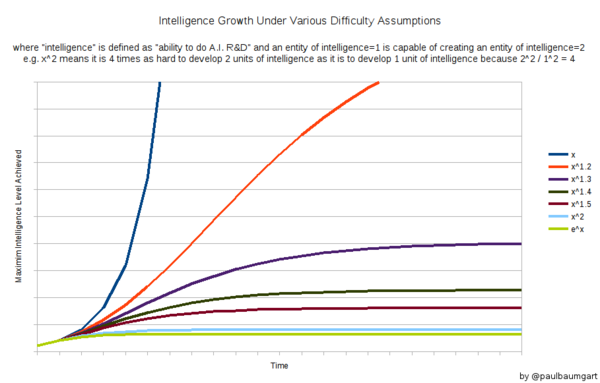 Almost any non-linear difficulty in boosting intelligence means that no runaway occurs. (Note that these do not include the benefit of getting new hardware over time and general speedup from Moore’s Law, for so long as that continues. But they do include the benefit of designing new hardware for itself or any speedup that it can cause to Moore’s Law.) The bottom line, in green, is exponential difficulty (ex). Many real-world problems are exponentially difficult as they grow in size. The ‘traveling salesman’ problem is an exponential problem (at least to find an exact solution). Modeling quantum mechanical systems is an exponential problem. Even some important scenarios of protein folding are exponentially difficult. So it’s not at all unlikely that boosting intelligence would fall into this category. And as you can see,if intelligence is exponentially difficult, the super-intelligence does ascend. Or to put it perhaps more clearly, for a fixed amount of computation, at each greater level of intelligence, a smaller increase in intelligence can be realized with that amount of computation. Theorists have proved that some mathematical problems are actually so complicated that they will always be challenging or even impossible for computers to solve. So at least for now, people who can push forward the boundary of computationally hard problems need never fear for lack of work. This tells us something important about AI. Like mathematics, intelligence is not just one simple kind of problem, such as pattern recognition. It’s a huge constellation of tasks of widely differing complexity. So far, the most impressive demonstrations of “intelligent” performance by AI have been programs that play games like chess or Go at superhuman levels. These are tasks that are so difficult for human brains that even the most talented people need years of practice to master them. Meanwhile, many of the tasks that seem most basic to us humans—like running over rough terrain or interpreting body language—are all but impossible for the machines of today and the foreseeable future. As AI gets more capable, the sphere of jobs that computers can do faster or more accurately than people will expand. But an expanding universe of work will remain for humans, well outside the reach of automation. This argument is valid as far as it goes and can probably be formalized. But is the argument sound? One difficulty with applying computational complexity theory outside of its usual area is that people tend to neglect the requirements of complexity theory which gives it its generality: that it omits the ‘constant factors’ and the actual runtime, that many of the statements are lower/upper bounds or statements about worst-case complexity, that the statements tend to be about specific algorithms which are by no means the only way to solve a real-world problem, and that it doesn’t try to say anything about utility or consequences. Similarly, people sometimes reason that since a human and AI would be in the same computability class (Turing-completeness), that anything an AI could do or think, a human must also be able to do or think, but they neglect that humans do not have unbounded time or space like the idealized Turing machine and there is no more reason to expect understanding to be possible than to expect an ant to understand everything a human does before it dies of old age; an ant with galaxies of notebooks and billions of years could perhaps understand human civilization, but no such ant has ever existed or ever will, and the understanding of that ant of human action will ultimately be in its notebooks rather than itself. The question of whether such tasks are feasible for a “compact, efficient computer program”, not just computable, may take on both metaphysical and practical significance (to paraphrase Scott Aaronson). Laid out bare, I would have to say that the argument depends critically on each of the premises being true, but every premise 1-5 is either questionable or false. giving up determinism and using randomized algorithms which are faster but may not return an answer or a correct answer1 (they typically can be run many times if correctness is important; after a few times, the probability of an error will be smaller than the probability that the computer hardware has suffered a glitch due to cosmic rays); randomization can be applied to algorithms and to data structures. Rather than merge sort, one could use Quicksort—merge sort has better worst-case complexity than Quicksort (which renders it vulnerable to DoS attacks if there are adversaries who can force the worst-case O(n2)), but Quicksort is still usually faster. Likewise, in the worst case, 3-SAT/Traveling Salesman are wildly intractable for any realistic dataset like planning a trip across the USA; but the average-case performance is quite different and in practice, 3-SAT/Traveling Salesman are solved all the time, to the extent where SAT solvers are routinely used in computer security or theorem proving or type-checking and logistics companies are able to heavily optimize their shipping with them. Similarly for linear programming’s simplex algorithm and other operations research algorithms, with are theoretically intimidating but in real-world problems yield solutions after reasonable runtime—they work in practice, but not in theory. For example, TSP instances up to 85,900 cities have been solved. giving up generality: an algorithm may be unnecessarily general. A comparison sort can be done in O(n⋅log(n)), yes, but one frequently doesn’t need to sort any kind of datatype for which an ordering is available but specifically strings, numbers, etc, for which quasi linear/O(n) sorting is possible using counting sort/radix sort. An algorithm could also have prior information about the kind of data input which will be available—Timsort is aware that most inputs will be partially sorted already and can outperform a naive sort. Data structures can be tuned for particular distributions of data, and JIT & profile-guided optimization & supercompilation can be seen as specializing general algorithms to the current or likely-future inputs. Already mentioned is 3-SAT/TSP, for which there is a World Tour of 1,904,711-cities which has been solved with a tour within 0.0474% of the optimal tour by 2007, and planning problems soluble by translation into SAT form can have millions of clauses & variables2; Naam gives chemistry as an example by noting that while the exact physics is totally intractable, approximations which are much more feasible are used. The last fraction of a percentage point of optimality can take truly enormous amounts of computation to squeeze out. changing the problem rather than succumbing to functional fixity: many problems can be redefined or environments can be tweaked to bypass a challenge & leverage computer strengths. All processes that are stable we shall predict. All processes that are unstable we shall control. solving entirely different problems which humans cannot or will not solve. As Hamming says, “There are wavelengths that people cannot see, there are sounds that people cannot hear, and maybe computers have thoughts that people cannot think.” There are problems humans could never solve because it would require too much training, or too much memory, or too bizarre solutions. A human would never come up with many solutions that genetic algorithms or neural networks do, and they can be used on scales that humans never would; an unimportant but interesting example would be “PlaNet—Photo Geolocation with Convolutional Neural Networks”—I can’t imagine any human ever beginning to compete with such a CNN, or even trying to accomplish the same thing. In such cases, scaling concerns are totally besides the point. Several of these categories might ring familiar to those interested in computer security, because computer security suffers from similar issues in the attempt to close the gap between the theoretical guarantees about the security of particular cryptography algorithms and what security one gets in practice. In particular, the Edward Snowden NSA leaks have demonstrated the remarkable breadth of ways in which the NSA goes about breaking computer security without needing access to theoretical breakthroughs or exotic quantum computers (and indeed, the NSA is more than a little contemptuous of the academic computer security/cryptography communities for their misguided focus on theory): computers can be intercepted in the mail and hardware bugs implanted; computers can be monitored remotely using various radio and phreaking devices; airgapped networks can be jumped by malware hitch-hiking on USB drives or buried ineradically inside BIOSes of devices like hard drives which have their own processors; data which is not at rest can be stolen from otherwise-secure data centers by tapping private fiber optic links (eg Google); more public fiber optic cables such as underseas cables are hacked using ISP assistance and submarine operations, in some cases entire days of raw traffic being retained for analysis; encrypted data can be retained forever for future decryption (such as by the NSA’s active quantum computing R&D effort); Internet-wide attacks can be mounted by factoring certain very commonly used numbers using NSA’s large computational resources and likely specialized ASICs (the amortized cost of factoring many keys simultaneously is different and much smaller than the usually calculated cost of cracking a single key); private keys can be stolen by using subpoenas or national security letters or hacking in or even physical breakins; data can be traded with the intelligence agencies of other countries or their own hacking operations hacked by the NSA (and vice versa); backdoors can be introduced into otherwise-secure software (Dual_EC); commonly used software can be extensively audited, with bugs discovered and exploited long before they are publicly known (Heartbleed); Internet connections can be hijacked and diverted to NSA servers to serve up malware. This gives an idea of the difficulties faced when trying to be secure: where does one trustably get one’s computer and the software on it? How many 0-day vulnerabilities are there in the operating system and all the cryptographic software? The encryption algorithms may be insecure, or implemented insecurely, or exist decrypted somewhere, or be run on subverted hardware, or the contents inferrable from metadata & other activity. Hence, the exact difficulty of integer factoring or the existence of one-way functions is often among the least of the factors determining the security of a system. …while P?=NP has tremendous relevance to artificial intelligence, it says nothing about the differences, or lack thereof, between humans and machines. Indeed, P≠NP would represent a limitation on all classical digital computation, one that might plausibly apply to human brains just as well as to electronic computers. Nor does P≠NP rule out the possibility of robots taking over the world. To defeat humanity, presumably the robots wouldn’t need to solve arbitrary NP problems in polynomial time: they’d merely need to be smarter than us, and to have imperfect heuristics better than the imperfect heuristics that we picked up from a billion years of evolution! Conversely, while a proof of P=NP might hasten a robot uprising, it wouldn’t guarantee one. This doesn’t disprove the complexity class, which is about asymptotic scaling and will still kick in at some point, but if it’s possible to double or dectuple or more the input, this is enough of an increase that it’s hard to dismiss the difference between best and worst agents’ problem sizes as being only ‘slight’. By analogy, if designing intelligence is an N2 problem, an AI that is 2x as intelligent as the entire team that built it (not just a single human) would be able to design a new AI that is only 70% as intelligent as itself. That’s not escape velocity. Second, an intelligence explosion scaling even superlinearly at, say, O(n2) would result in absolutely enormous practical differences, although I can’t understand what model Naam has in mind exactly—designing intelligence can’t literally work as he describes with the AI getting dumber because the original AI could simply copy itself to ‘design’ a new AI which is 100% as intelligent as itself at little computational cost, but it’s unclear what sort of input/output variables are going into this scaling equation. Naam’s endorsement of the spreadsheet/chart in the second post implies that he is thinking of a model in which the input is some unspecified unit of computation like 1 GPU-year, and the output is an additional ‘unit’ of intelligence, in which case it does make sense to observe that where the AI previously got a 100% increase in intelligence for spending that 1 GPU-year, now it only gets a <100% increase; in this scenario, it gets a smaller increase each computation unit and (with appropriate asymptotics) it may converge on some finite upper bound. But you could just as easily express this relationship the other way around, and note that the number of computation units for each doubling of intelligence is increasing steeply. Looked at this way, there’s no reason to expect convergence on a finite bound, or even the intelligence increase to slow down—because the fixed computation input assumption becomes glaring; the AI simply “must construct additional pylons”, as it were. A little perspective from animal intelligence may be helpful here; as a simple model, animal intelligence seems closely related to total number of neurons moderated by body size/sensory requirements. Starting at 0, we have the sponge; by 250,000 neurons, we have the fly (which can accomplish behaviors like flying around but little in the way of planning) and the ant (simpler locomotion but capable of simple planning and in conjunction with many other ants, surprisingly complex emergent behavior); at 1,000,000, we have the frustratingly tough cockroach, and at 16,000,000, the frog; by 71,000,000, the common house mouse, which can be taught tricks, solve complex planning tasks and mazes, and is respectably intelligent. Clearly the scaling here is not linear—it’s hard to argue that the mouse is 284 times smarter than a fly. The scaling gets worse as we continue; the star-nosed mole has 131,000,000 but is it twice as intelligent as the house mouse? Only at the octopus with 500,000,000 does one recognize a real difference in intelligence, and thankfully the cat shows up at 760,000,000. But for a creature which has ~11x the neurons, the cat doesn’t seem to be as good at catching mice as one might expect! From there, the neuron count gets worse and worse—capuchins need almost 4 billion neurons, macaques almost double that, and humans require a cool 86 billion neurons, 113x a cat (with elephants at 267 billion, but as much as those neurons are used up by their enormous body size, they are still eerily, disturbingly, intelligent) Plotted on a graph by some formal or informal measurement of behavioral complexity, we have a super-linear asymptotic; animal psychologists are always discovering ways in which human behaviors have roots in animal antecedents, implying that humans are, on an absolute level, not that much smarter. Surely each neuron added along the way suffered from diminishing returns. We already live in a world with diminishing returns to computational resources! Yet, despite that asymptotic, it clearly has been possible for humans to defy this scaling and develop brains with almost a hundred billion neurons (and elephants triple that) and considerable room for further growth (Hofman 2015), and this evolution has also led to enormous real-world consequences: humans not just control the earth, they have remade it in their own image, driven countless species extinct or to the brink of extinction (as other primates can attest) as humans (and their world) changes faster than most species are able to adapt, and done impossible things like gone to the moon. And all this in a blink of an eye. Aside from the issue that the complexity claims are probably false, this one is particularly questionable: small advantages on a task do translate to large real-world consequences, particularly in competitive settings. A horse or an athlete wins a race by a fraction of a second; a stock-market investing edge of 1% annually is worth a billionaire’s fortune; a slight advantage in picking each move in a game likes chess translates to almost certain victory (consider how AlphaGo’s ranking changed with small improvements in the CNN’s ability to predict next moves); a logistics/shipping company which could shave the remaining 1-2% of inefficiency off its planning algorithms would have a major advantage over its rivals inasmuch as shipping is one their major costs & the profit margin of such companies is itself only a few percentage points of revenue; or consider network effects & winner-take-all markets. This also ignores the many potential advantages of AIs which have nothing to do with computational complexity; AlphaGo may confront the same PSPACE scaling wall that human Go players do, but as software it is immortal and can be continuously improved, among other advantages (Sotala 2012, Yudkowsky 2013). Premise 5 would seem to assume that there is no such thing as compound interest or exponential growth or that small advantages can accumulate to become crushing ones; which of course there is for companies, countries, and individuals alike. Expanding on the observation that AIs can have advantages which are unrelated to computational complexity or solving larger instances of problems, is it really the case that a Singularity can happen only if AIs are able to surpass humans on particular algorithmic tasks? This is unlikely. For example, in a whole-brain emulation scenario (Sandberg & Bostrom 2008), such uploaded minds would not necessarily be gifted with any new accomplishments with regard to complexity classes but can we really swallow the argument’s conclusion that this scenario simply cannot lead to any major changes worthy of the name Singularity? Far from it—it seems that such an achievement would radically change human society in a number of ways, ranging from redefining mortality to accelerating neuroscience to transformations of the economy as such emulated brains can be copied indefinitely onto as much hardware as is available (consider Robin Hanson’s extrapolations in Age of Em; a world-champion-level human Go player requires millions of children sampled and 15+ years to train, while an AlphaZero is simply copied over to another computer). It would be surprising if one could run human-level intelligences (perhaps arbitrarily many of them) on a pocket smartphone, with millions or billions of them across the world, even outnumbering regular biological humans, and still have no ‘Singularity’ through sheer numbers. Once upon a time, two C. elegans were debating the prospect of “transwormism”, and specifically the possibility of hypothetical creatures from elsewhere in the space of all possible organisms, which might exceed worms by as much as worms exceed the bacteria they thrive upon. So they did. A week later, the farm was sold to a real estate developer to build townhouses on. The mound was flattened by a steam roller, and then paved over with asphalt—the construction workers neither hated nor loved the worms, but they were made of atoms useful for stabilizing the road to the new development. Computational complexity classes offer little guidance about the capabilities of humans, AIs, or other agents as they are too universal and generalized and do not tightly bind outcomes; at most, they demonstrate that neither humans nor AIs are omnipotent. If one wants to put limits on the ability of an AI by way of computational resources, a much more detailed analysis must be done linking data/sample efficiency or algorithmic performance to capability improvement to performance on an ensemble of tasks & access to additional resources, with the consequent economic, military, or social outcomes. A classic cognitive bias in technological forecasting is motivated-stopping and lack of imagination in considering possibilities. Many people use a mental model of technologies in which they proceed in a serial sequential fashion and assume every step is necessary and only all together are they sufficient, and note that some particular step is difficult or unlikely to succeed and thus as a whole it will fail & never happen. But in reality, few steps are truly required. A technology only needs to succeed in one way to succeed, and to fail it must fail in all ways. There may be many ways to work around, approximate, brute force, reduce the need for, or skip entirely a step, or redefine the problem to no longer involve that step at all. Examples of this include the parallel projects used by the Manhattan Project & Apollo program, which reasoned that despite the formidable difficulties in each path to the end goal, at least one would work out—and they did. In forecasting, to counter this bias, one should make a strong effort to imagine all possible alternatives which could be pursued in parallel, and remember that overall failure requires all of them to fail. The core mistake in this fallacy is reminiscent of the creativity tests which ask the subject to accomplish a task like making a candle holder from common objects like a box of soap and thumbtacks, or to come up with as many possible uses for a brick as possible; a subject who insists that a brick is a brick, and will not reimagine the box of soap as an open box which could be mounted on the wall, will never solve the tasks well, will be surprised when others accomplish it easily, and perhaps feel deep down that the others cheated (even if it worked perfectly well). Defining a system, one might treat it as a “conjunctive” system where everything has to work: D depends on C1, C1 depends on B1, and B1 depends on A1; so if any problem is found is A1, B1, or C1, the entire system can be treated as debunked and an impossible contraption. It suffices to show that probably ~A1, so probably ~D too. The problem with this way of thinking is that it may be adequate for immediate criticism of a specific system and a useful approach for engineering it, but it is not the same thing as answering whether D will be accomplished in 10 years or if the system is a good idea! Because such a criticism can be fixed by using a different A2, or perhaps A3, or A4, or A5, or A6, or maybe not even needing something like A at all and switching to a different system D/X1/Y1/Z1. The critic asks “can I think of any reason this system might not work?” and stops as soon as they find 1 reason, but the forecaster needs to ask, “can I think of any system like this which could ever work?” and keep going. Most technology goals are “disjunctive” in the sense that “anything goes” as long as it accomplishes the final goal, and it doesn’t matter how many dead ends get tried. If one way ‘hurts’, “don’t do that, then” and find a different way. To fly, it is not necessary to recreate a bird’s wing, only to find some way to fly—and there turn out to be many different propulsion methods which succeed at the task of flight but bear little resemblance to how a bird flies (hot air, lighter-than-air gases, propellers, jet engines, ramjets, rockets, gliders). A critic of the Wright or Montgolfier brothers would have been perfectly correct in noting that their methods could not and would never lead to bird flight, and wrong if they had then tried to proclaim that human flight was impossible or centuries away. Similarly, the Manhattan Project and the Apollo Project had a specific technology goal, but the goal was disjunctive in that any of several methods of refining uranium or plutonium or going to the Moon could have achieved the goal, each had formidable technological & scientific obstacles and had critics predicting failure, but only one had to work out; with money no object, they pursued multiple methods in parallel, and at least one did work out. Similarly, Thomas Edison knew many people had failed to create a useful electric lightbulb before him, and failed to create one himself after trying out hundreds of variants; did this mean that an electric lightbulb would never be invented? No, it just meant that he had to keep trying filaments until he found one that worked, and that was all he needed. One might analogize R&D to computer hackers: both share a security mindset where they only need to find one way in past the defenses thrown up in their path by Nature or corporations; if the firewall can’t be penetrated, then try hacking their printer, inject a weird machine into their servers, or just try calling up the secretary, say you’re the CEO, and ask for the password! There is rarely a need to be rigid about the exact method, as long as the result works; we are free to be flexible. If virtual reality headsets require 4K resolution per eye to deliver satisfactory VR experiences but this is too hard for GPUs to render fast enough, does this prove VR is impossible, or does it simply mean we must get a little creative and explore alternative solutions like using “foveated rendering” to cheat and render only a fraction of the 4K? In 10 years, should you expect this to be an issue? No, because resolution & quality is a disjunctive problem, just like motion-sickness in VR before it, which was fixed by a combination of continuous resolution/optics/FPS/locomotion/controller-hand-tracking/software/game-design fixes; there is no component which can be proven to be unfixable and universal across all possible solutions. If vacuum tubes will, for good physics reasons, cease to be shrinkable soon, does that mean Moore’s law is doomed and computers will always be ENIAC-sized, or, is it a conjunctive problem where any computational substrate can work, and the sigmoid of vacuum tubes will be replaced by other sigmoids of transistors, maintaining Moore’s law into the modern era? (Indeed, any exponential growth may turn out on closer inspection to be a stack of sigmoid growths, where alternatives are regularly found in order to make further progress; a correct argument that a particular technology will soon top out still does not prove that the exponential growth will stop, which would require proving that no alternatives would be found after the current sigmoid.) If GOFAI expert systems turn out to not be great, are expert systems a conjunctive problem where they are the only possible way of approaching artificial intelligence, or can artificial intelligence be solved in many ways and progress continue? If Bitcoin transactions are only pseudonymous and cryptocurrency blockchains scale poorly, are those conjunctive or disjunctive problems? (The answer should be easy even if you do not follow all the proposals for improvements like SegWit/MimbleWimble/sharding/MAST/scriptless scripts/Schnorr etc.) If genetic studies like GWASes are only able to explain a small percentage of measured individual differences at a particular point in time, does that prove GWASes are a failed methodology and that genetics in general is unimportant, or should we note that data will continue piling up and that there are a dozen ways in which GWASes are inefficient & we expect the growth in predictive power to continue? How many different sensors could self-driving cars draw on to achieve human-level safety? etc. A similar observation holds for impossibility proofs and no-go theorems. Often, these arguments seem impressive but in practice, people continue to do the impossible or go where they shouldn’t; why? The proofs may be entirely correct, but as with any proof’s assumptions and theorem, the devil is in the details: perhaps the assumptions are not plausible in the first place, or the theorem doesn’t mean what you thought it meant. It might be impossible to create an algorithm with 100% accuracy, but the errors occur only on inputs that never occur, or the result is an approximation which is however indistinguishable from an exact answer for all intents & purposes or is less likely to be wrong than one’s computer or brain to be hit by a cosmic ray or stroke while thinking it through. And so on. A relevant example of this phenomenon comes up in discussing AI risk: one type of argument that AIs cannot ever be dangerous and AI risk is not real relies on an argument from worst-case algorithmic complexity, observing that many important problems like 3SAT are NP-hard, where the required computation quickly increases to infeasible levels, so humans and AIs must be equivalently intelligent, therefor AIs cannot be dangerous (see above); unfortunately, every premise is vulnerable—worst-case is often irrelevant, the ignored constant factors can be critical, small differences in intelligence/capability can have large compounding effects particularly in competitions, problems can be rearranged to bypass or make them easier, extremely large amounts of computation can be thrown at problems, AIs could have many advantages like immortality which are simply orthogonal to computational complexity, etc. There is nothing wrong with the proofs of what complexity class 3SAT is in, it’s just that what is proven is not necessary to the argument and what is necessary to the argument is not proven. When is it valid to argue from a conjunctive perspective? Sometimes, it is possible to come up with a universal proof like one based on laws of physics; if a goal turns out to be thermodynamically or information-theoretically impossible, that’s a good hint that no one is going to achieve it. So for the much-debated possibility of cryonics, a valid disproof would be to demonstrate that all the relevant information in the human brain is lost or destroyed within minutes/hours of death; an invalid conjunctive disproof would be to set up a chain of probabilities like “10% chance you die in a hospital, 10% chance you are vitrified within a few hours, 10% chance ALCOR doesn’t go bankrupt, 10% chance your body can be regrown healthily… thus, there’s ~0% chance it’ll work”, because each step is not really conjunctive but disjunctive (one can die elsewhere, the time window is not known, a cryonics organization bankruptcy != rethawing, growing bodies is not the only possible good outcome, etc). Other times a technology may be inherently bottlenecked at a step all of which possible implementations are very difficult and it becomes quasi-conjunctive, versus a competing paradigm which is disjunctive. An example there is iterated embryo selection (IES) vs genome synthesis for creating ultra-highly-optimized human genomes: iterated embryo selection requires close control over converting stem cells to gametes and back in order to exert selection pressure over many ‘generations’ to optimize for particular traits, and given the trickiness of coaxing cells into regressing to stem cells and developing into particular cell types, there is probably only one effective procedure and no real alternatives; but ‘genome synthesis’ is simply the idea of synthesizing an entire human genome from scratch to a pre-specified optimally-designed genome, and, like the many competing techniques in genome sequencing, there are many different methods of combining nucleotides to build up a custom genome, which contribute to the (yes, exponential) fall in genome synthesis costs, and many further methods proposed (like specialized yeast) to reduce costs even further to the point where human genomes can be synthesized for a few million dollars each (and then reused arbitrarily often). IES is strongly conjunctive: if the stem cell steps can’t be solved, the entire cycle falls apart; genome synthesis is disjunctive: any of several methods can be used to synthesize nucleotides, and many more can be tried. Which one can we expect first? IES has a considerable headstart but genome synthesis progresses like a metronome because if it gets blocked on one track, it can hop to another; so my money is on genome synthesis at the moment. Are there any hard constraints from powerful theories like thermodynamics, evolution, or economics bounding the system as a whole? Breaking down by functionality, how many different ways are there to implement each logical component? Is any step a serious bottleneck with no apparent way to circumvent, redefine, or solve with brute force? Do its past improvements describe any linear or exponential trend? What happens if you extrapolate it 20 years (in the grand scheme of things, a minor error of timing)? If the trend is exponential, is it a set of stacked sigmoids indicating considerable flexibility in choice of technology/method? What experience curves could this benefit from in each of its components and as a whole? If the cost decreases 5% for every doubling of cumulative production, what happens and how much demand do the price drops induce? Are any of the inputs cumulative, like dataset size (eg. number of genomes sequenced to date)? Does it benefit from various forms of Moore’s laws for CPUs, RAM, HDD, or GPU FLOPs? Can fixed-cost hardware or humans be replaced by software, Internet, or statistics? Is any part parallelizable? What caliber of intellect has been applied to optimization? What amount of ‘constant factor’ slack is left in the system to be micro-optimized away? Change the answer required. Allow approximation, or allow a partial answer. Do not insist on an exact answer. Change the algorithmic method. Allow algorithms that can be wrong, or allow algorithms that use randomness. Do not insist that the algorithm is a perfect deterministic one. This is exactly what Chayes and her co-authors have done. A peculiarity of SAT problems obtained by translation from the standard planning benchmark problems from the planning competitions, in contrast to SAT problems representing many other applications, is their extremely large size and the fact that these problems can still often be solved quickly. The largest SAT problems Lingeling solves (within the time bounds explained earlier) are instance 41 of AIRPORT (417476 propositional variables, 92.9 million clauses) and instance 26 of TRUCKS (926857 propositional variables, 11.3 million clauses). The asymptotically best algorithms frequently turn out to be worst on all problems for which they are used. In general I’m looking for more focus on algorithms that work fast with respect to problems whose size, n, is feasible. Most of today’s literature is devoted to algorithms that are asymptotically great, but they are helpful only when n exceeds the size of the universe…Another issue, when we come down to earth, is the efficiency of algorithms on real computers. As part of the Stanford GraphBase project I implemented four algorithms to compute minimum spanning trees of graphs, one of which was the very pretty method that you developed with Cheriton and Karp. Although I was expecting your method to be the winner, because it examines much of the data only half as often as the others, it actually came out two to three times worse than Kruskal’s venerable method. Part of the reason was poor cache interaction, but the main cause was a large constant factor hidden by O notation. The Coppersmith-Winograd algorithm is frequently used as a building block in other algorithms to prove theoretical time bounds. However, unlike the Strassen algorithm, it is not used in practice because it only provides an advantage for matrices so large that they cannot be processed by modern hardware. Vasik Rajlich, the programmer behind Rybka, gives a more pessimistic spin to what we have learned from the chess-playing programs. In Rajlich’s view, the striking fact about chess is how hard it is for humans to play it well. The output from the programs shows that we are making mistakes on a very large number of moves. Ken’s measures show that even top grandmasters, except at the very peaks of their performances, are fortunate to match Rybka’s recommendations 55% of the time. When I compare a grandmaster game to an ongoing Rybka evaluation, what I see is an initial position of value being squandered away by blunders—if only small ones—again and again and again. It’s a bit depressing. Rajlich stresses that humans blunder constantly, that it is hard to be objective, hard to keep concentrating, and hard to calculate a large number of variations with exactness. He is not talking here about the club patzer but rather the top grandmasters: “I am surprised how far they are from perfection.” In earlier times these grandmasters had a kind of aura about them among the chess-viewing public, but in the days of the programs the top grandmasters now command less respect. When a world-class player plays a club expert, the world-class player looks brilliant and invincible at the board. Indeed, the world-class player does choose a lot of very good moves. At some point his superior position starts “playing itself,” to use an expression from the chess world, and just about everything falls into place. When the same world-class player takes on Shredder, to select an appropriately named program, he seems more like a hapless fool who must exert great care to keep the situation under control at all. And yet it is the very same player. That gap—between our perception of superior human intellect and its actual reality—is the sobering lesson of the programs.